Sunesta retractable patio awnings like this one can transform any outdoor area into your own personal oasis. 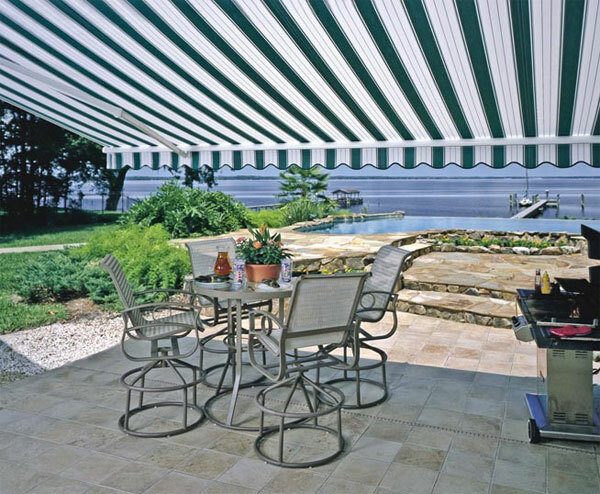 If you find yourself in need of extra shade or are looking to add usable space to your property, but are hesitant to invest in adding a permanent fixture, it may be time for you to consider a retractable awning. The retractable awning is ideal for deck and patio usage and have numerous benefits, including protecting your loved ones from harmful rays of sunlight and uncomfortable rain. 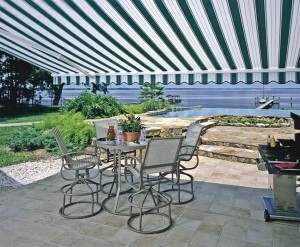 There are numerous types of awnings to choose from: from Sunbrella to Sunlight to Sunstyle to Sunesta. There are automatic awnings and manual awnings, which you can choose from depending upon your needs. Awnings are traditionally made from several materials, though when it comes to custom awnings, the sky is the limit. These traditional retractable awning materials include canvas, vinyl, and other fabrics which are water resistant. Awnings are also available in a number of different colors, which allow them to fit in seamlessly with the look of any home. Read on to learn more about the benefits of different types of the retractable awning. Sunesta awnings can transform any outdoor area into your own personal oasis. Sunesta Premium Class Retractable Outdoor Awnings can change the usability and comfort of your living area. These unique awnings allow sunlight to peek through and warm your space where you want it and creates comforting shade where you don’t. Sunesta awnings have numerous beneficial components, such as strong PVC coated arms, mounting for numerous surfaces, wireless retractable awning controls, and one piece weather sealed hoods. Sunlight retractable awnings increase your home’s usable space and helps to create ideal days outside enjoying the warmer weather. Sunlight awnings offer not only shade, but adds beauty and increases the market value of your home. This retractable awning offers multiple add-on options and five different projections. These awnings offer sunlight protection to any home, and are yet another option when it comes to increasing the usable space of your property. Rain or shine, the party will be in full swing when your space makes use of a Sunstyle, Sunesta, or Sunlight retractable awning.